The other day I was listening to an episode of Back to Work while taking a break from my actual work, and Merlin Mann made an offhand reference to smart playlists, a vastly underrated feature of iTunes he has written about extensively on his old blog. Listening to him, it suddenly occurred to me that I hadn't made a smart playlist of my own in quite a while. Autumn was in the air, and something about autumn always makes me think of adolescence, so I decided to build a playlist of the lo-fi indie rock (Pavement, Guided By Voices, Sebadoh, Superchunk, etc.) that I used to listen to when it was 18. In the process of playlist building, I began to consider what a strange and strangely powerful influence smart playlists have had on my life. The first time I ever used a CD player, the shuffle function struck me as its most powerful feature. As much as I like the album as an art form, I also love the idea of laying different songs against each other, creating new combinations of sound. Eventually, I got a 5 disc CD player, and I made extensive use of its shuffle function as well, but I wanted more. I wanted to shuffle all my music, and when MP3 players first came on the scene, I sensed this was finally possible. I shied away from the pricey iPod, though, until I heard about smart playlists. The idea, if you aren't already familiar with it, is simple. 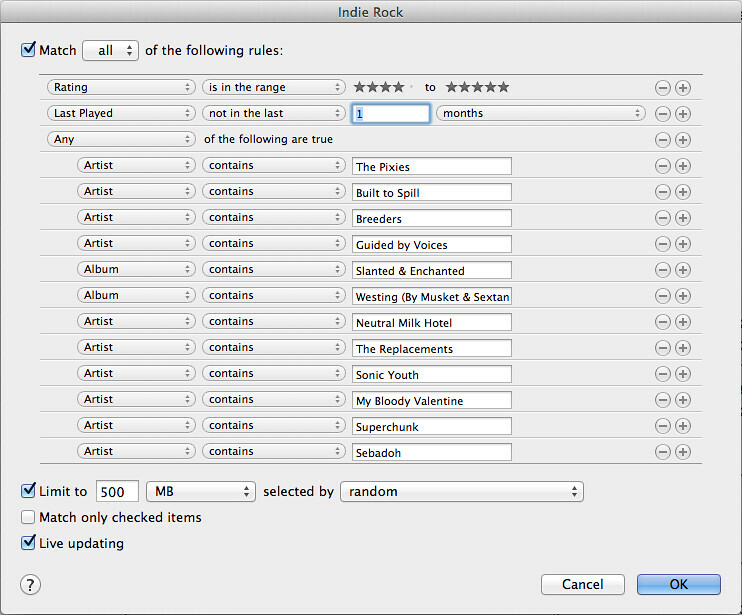 iTunes tracks all kinds of data about the songs you listen to. It knows the name of the artist, the name of the album, the genre, when you added it to your library, when you last listened to it, how often you've listened to it, how many times you've skipped it, whether you've given it a rating of 1 to 5 stars, and so on. A smart playlist makes it possible to leverage all of this data to serve up exactly the kind of music you want to listen to at this moment. The concept of smart playlists blew my mind. I knew next to nothing about computers, programming, or any software really other than Microsoft Office. But I understood at once that with smart playlists, I could not only shuffle all my music, but do so in as many different ways as I could possibly imagine. I could shuffle just songs I hadn't heard in the past year, just songs I'd rated five stars that I hadn't heard in the last year, just indie rock songs I'd rated five stars that I hadn't heard in the last year, and so on. The possibilities were endless. It was the lure of smart playlists that got me to buy an iPod, which got me to buy my first Macbook, which got me interested in indie software, which got me interested in things like Quicksliver and Omnifocus, which got me interested in blogs like 43 Folders and podcasts like Back to Work, which led me to a Saturday afternoon near the end of autumn in 2013, listening to a podcast with Merlin Mann talking briefly about smart playlists on my iPhone. The playlist I made that afternoon consisted of music that hadn't been easy to come by in the suburban New Jersey town where I grew up; I had to make special trips to record stores in Hoboken and New York City to track down albums like Slanted and Enchanted and Bee Thousand when they first came out. But I carried those CDs with me through college and grad school and eventually ripped them into mp3s, which I stored on the hard drives of several successive computers. I don't even own the discs any more. What amazes me is that I now have the power to write a mini-software program that will sift through those scratchy lo-fi music files, as one might sift through scratchy lo-fi memories, to find songs I'd forgotten I even knew I loved. Which is a long way of saying that software is magic.